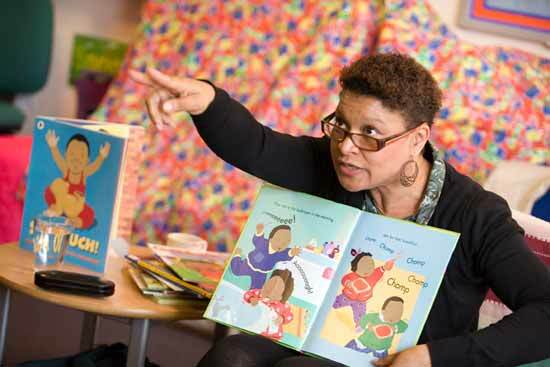 Trish Cooke is the award-winning author of such acclaimed and enduring picture books as Full, Full, Full of Love and So Much!, which was recently included in UK book list ‘The 50 Best Culturally Diverse Children’s Books‘. As well as writing children’s books, Trish is a scriptwriter for radio, television (including children’s programmes Playdays and Tweenies) and theatre: her pantomime Cinderella was nominated for an Olivier Award in 2007. Trish is also an actress, and many young parents reading her books to their children today will remember her from their own childhood as one of the presenters on Playdays in the late 1980s/1990s. 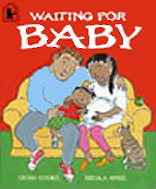 Trish’s book Waiting for Baby was one of the stories that were constantly on the reading pile for my older son in the months before (and after!) his brother’s arrival, so I am especially delighted to welcome Trish to Mirrors Windows Doors to talk about her latest picture book Look Back!, in which a grandmother shares a deliciously scary story from her native Dominica with her British-born grandson; and, in keeping with our current Trees theme, about The Grandad Tree, a beautiful story that is especially valuable for sharing with children who have lost a beloved grandparent. Glad you asked this question because firstly I have to point out that we are not talking about The Dominican Republic! 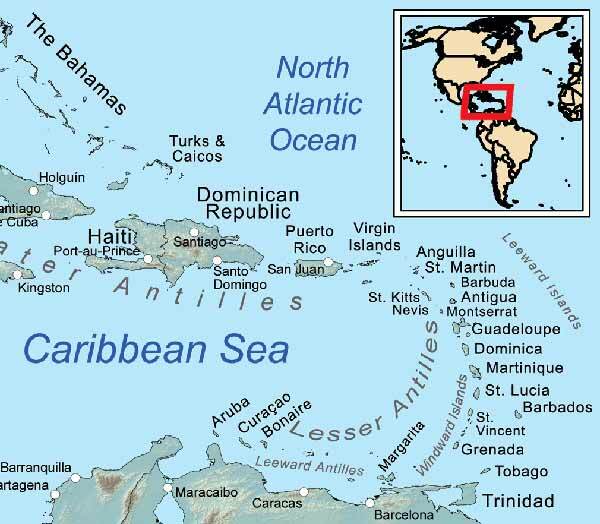 We are talking about The Commonwealth of Dominica which is a small Caribbean island between Martinique and Guadeloupe . This is so important to point out because many people confuse the two. …including me! But the misnomer has now been blushingly edited out of the question and we can all have the correct location in our mind’s eye as we read Trish’s interview, which certainly conjures up wonderful images of the Dominican landscape. Welcome, Trish. You have been described as ‘a Yorkshire lass who can speak Dominican patois’. Can you tell us about your childhood, growing up in northern England with Caribbean heritage? Growing up in Yorkshire was great. I must love it as I moved back to Yorkshire after living in London for 13 years. Family was the main reason for moving back. I have six sisters and three brothers, five of which were born in Dominica in the West Indies and five of us born in the UK. Mum and Dad and my siblings born in Dominica always talked about ‘back home’. Mum spoke often in the French Creole so I was able to understand and speak the language – so I had a mixed upbringing. School and home were very different. Looking back, I think I was always trying to fit in with the ‘English way’ at school, so I wasn’t really fully myself until I left. When I was 21 years old I went to Dominica for the first time and was surprised to find that I could speak French Creole better than my cousins who lived there because they weren’t allowed to. I felt very at home in Dominica, even though when I first went there I found it confusing when people immediately identified me as English. I felt very Dominican at the time. Over the years I have come to realise that my Dominican heritage and my Yorkshire/English upbringing are both very much part of who I am and I celebrate both. What kinds of story did you grow up with, and did you read much as a child? My mum and dad told me stories about what it was like in Dominica. I heard about people that were sung about in carnival songs. Stories were about real people that Mum and Dad had known. I also heard the traditional folk stories about the animals like Agouti and Goat. These stories were based on the Compère Lapin or Brer Rabbit stories. I read a lot of Enid Blyton stories too and imagined myself solving mysteries with my mates. Do you put different hats on for writing stories and theatre/television scripts or do you tap into a similar creative pool, as it were? Nice way of putting it. Yes, I wear lots of different hats according to what I am writing. I find I can tell the same story in lots of different ways and I have explored the Diaspora in children’s books, theatre, radio, and film: but each time I have approached the theme wearing a different ‘hat’, yes. Can you tell us about Ti Bolom, the unseen terror in Look Back!? Ti Bolom comes from one of the characters Mum and Dad told me about when I was a child. Ti is from the French word petit meaning little and Bolom is like a short sort of man. There are many interpretations of what Bolom is, some sinister; and it varies from island to island. In this book I have played around with the fear of the unknown. For me, Ti Bolom is a short gnome/elf-like, cheeky and mischievous being that likes to play tricks on people. You talked in an article for The Brown Bookshelf about how you were asked by Polly Pattullo of Papillote Press to retell a Dominican folktale. I like the way you have made the traditional story into something contemporary and filtered the audience’s reaction to Grannie’s story through the boy Christopher’s responses (and illustrator Caroline Binch is wonderful here, too). What inspired you to give the folklore surrounding Ti Bolom this contemporary twist? When I was a child, because I had never been to Dominica I would ask a lot of questions. My mum and dad loved telling me about what it was like growing up in Dominica. I suppose I am Christopher in the story but Christopher is also my children and grandchildren. I wanted to carry the character over to the contemporary UK because I wanted to pass the story on. It’s important to spread the word. Again I am dealing with the theme of Diaspora. From Caroline Binch’s illustrations, it’s clear that the story is partly set in the lush Dominican rainforest, although you don’t actually allude to the countryside in your text. How important is that forest imagery to the story, do you think? The Dominican rainforest imagery is very important. Caroline’s illustrations are very authentic. Dominica is such a beautiful place. It’s like the whole landscape is a character. When my mum and dad lived there, there weren’t any roads and so they had to walk through the forest to get to places. This story is all about what is real and what isn’t. The spirit world is a big thing in Dominica. When I am there, I can almost feel my ancestors in the air… I love what Caroline has done in her recreation of the forest. When you look into the leaves and bushes, you can see things that may or may not really be there! All in keeping with the story. Have you shared Look Back! with children? Yes, I have shared Look Back! with children in the UK and in Dominica. I do workshops and story sessions in schools so I get first-hand feedback. In the UK I like to emphasise Grannie’s voice; the children love it when I go into character. I also encourage the call and response, ‘Eh kwik’ ‘Eh kwak’, and get the children involved by asking them to respond to my call. It’s lots of fun. They love trying to work out whether Ti Bolom is real or not. I was invited to the Nature Island Literary Festival in Dominica just before the book came out and I read the story to a class of children. It was a wonderful experience for me to bring Ti Bolom back home. At the launch of Look Back! You use a lot of onomatopoeia, and Look Back! is no exception. Have sounds and the sounds of words always been important to you? What, for you, do they add to your writing? When I write I usually hear the story and the voices of the characters first. That’s in all my writing whether it’s a book or a script. The sounds and the rhythm of the words are important to me. I love music. Absolutely love it!!! I used to write a lot of songs when I was younger. Some of my plays for the stage have music in them too. I enjoy working with musicians. Look Back! 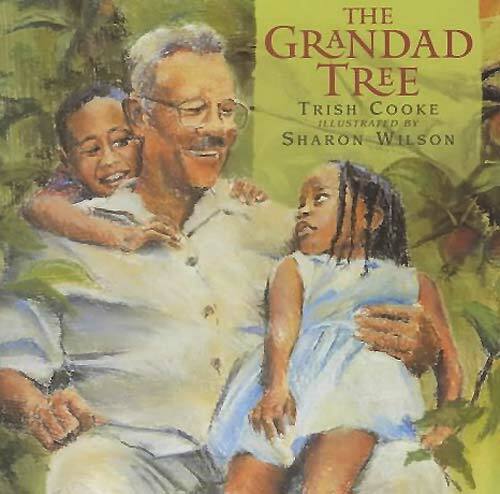 is a beautiful, intergenerational story, as is one of your early picture books, The Grandad Tree, about two children who realise they still have the apple tree in the garden to remember their grandfather by when he dies – and that life goes on, with the symbol of the pip that Leigh and Vin plant and nurture next to it. Your writing is spare and very gentle. Was this a difficult book to write? Yes. It was a difficult one to write but also necessary. I wrote it just after my dad died. My son was four years old at the time and he was asking a lot of questions about Grandad. I caught my son burying a dead bumblebee in the garden using ice lolly sticks to dig up the earth and make a little grave. I hadn’t taken him to Dad’s funeral (thinking he was too young) but in hindsight, I wish I had as some of his questions would have been answered during the funeral and he would have had closure. I wrote the book so that he could make sense of it all through exploring the cycle of life. I also wanted the book to be a celebration of Dad’s life. Where did your idea to link Grandad with the apple tree come from? Our neighbour had an apple tree that overlapped into our back garden and it seemed like a simple and perfect way to say what I was trying to say to my son. The cycle of the apple tree demonstrates life and the ‘seasons’ we go through – our spring, summer, autumn and winter years. The memory of Dad is something that my family passes on to our children daily so he remains with us forever. The image of an apple tree just does that for me. Sharon Wilson‘s pastel illustrations contribute a layer of meaning to your words. It’s a very special book. Did you communicate with each other during the book’s production? Generally, what kind of contact do you have with the illustrators of your books? It was difficult to find the right illustrator for The Grandad Tree because of the subject matter. Death seemed to make artists use dark, heavy colours and I was adamant that I wanted this book to be about celebrating life and I wanted lively colours. We tried a few illustrators but it didn’t work out. An amazing thing happened when Walker Books sent me the sketches that Sharon Wilson had done for The Granddad Tree. Sharon lives in Bermuda and had never met my dad or seen any photographs of him but yet when she sent her sketches the images of Grandad looked so much like my dad that I was stunned. I knew immediately she was the one. I loved her use of pastels and the colours she used were perfect. You’re right it is a special book. It’s my personal favourite because it always reminds me of my dad. During the book’s production we went through various drafts with Walker Books as we decided what should be shown in each illustration. I had no direct contact with Sharon at the time; any suggestions I had I discussed with my editor at Walker Books. Sharon and I are in touch now though and we email each other from time to time. I love her work. 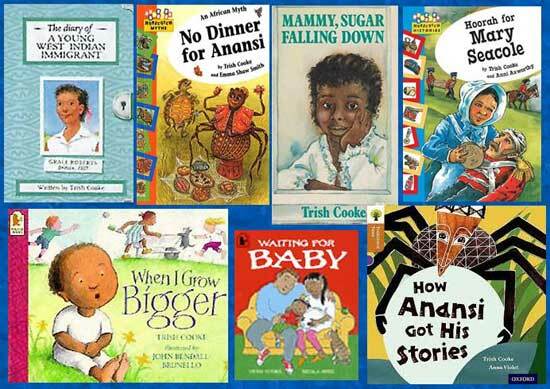 You have been writing stories about children with a West Indian background for many years. 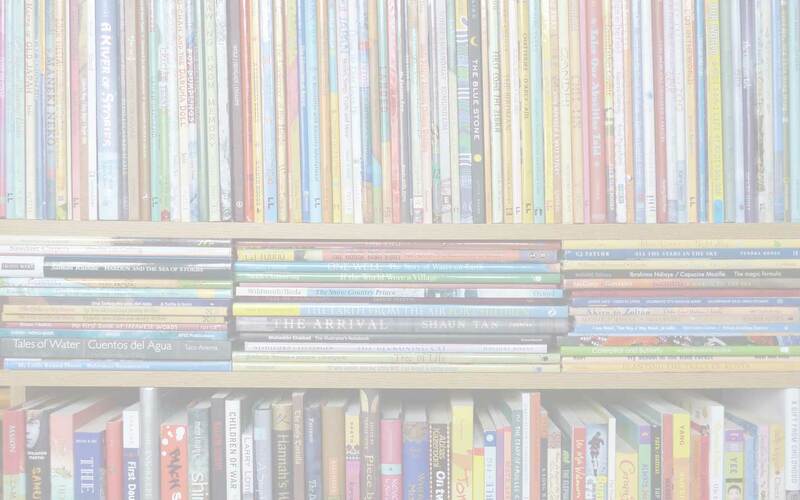 What changes have you found since you started, regarding diversity in children’s literature? 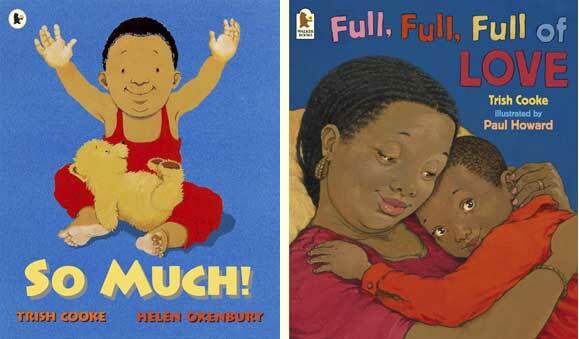 When I first started writing my children’s books there wasn’t much in regards to diversity in children’s literature. It has improved slightly but not enough. There are a few more out there now but still lots of room for plenty more books. What projects are you working on at the moment? Is there another picture book in the offing? What am I currently working on? Well, I have just finished working as a dramaturg, developing a new play with a theatre company called Pitch Lake Productions. I have also just delivered a 2nd draft of my Christmas show Robin Hood which will be on at The Theatre Royal Stratford East from November 2015 to January 2016. I have also just finished a book for Pearson Publishing. The title is still to be confirmed but it is about the phases of the moon and will be out at the end of this year. I am working on a second book for Pearson about the seasons, which will be out in 2016 – again the title is to be confirmed. I am also developing an idea I have for Young Adult fiction and putting down some ideas for something that I am hoping to work on later this year. I love writing and telling stories in lots of different forms so I am keeping myself busy. I am feeling very creative at the moment so lots going on. 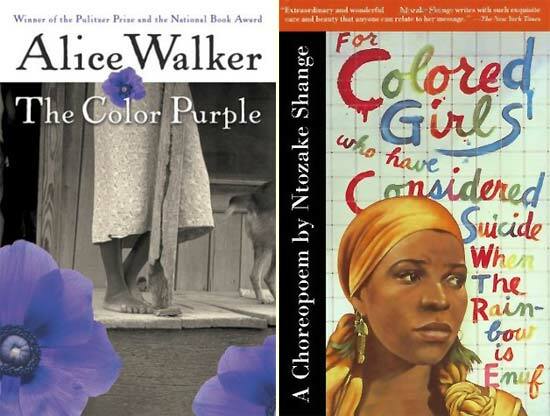 The Color Purple by Alice Walker and For Colored Girls Who Have Considered Suicide When The Rainbow is Enuf by Ntozake Shange. Both of these are by Black American women but I connected immediately. 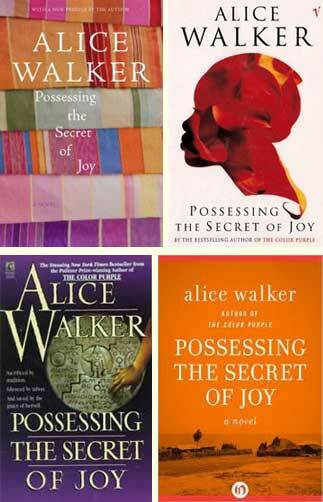 Possessing the Secret of Joy by Alice Walker. I was overwhelmed with how little I knew about female genital mutilation before reading this book. I love all trees but I think Oak is probably my favourite. The wooden handle of Mum and Dad’s walking stick. It was Dad’s first and then when he died Mum used it. I chopped off the handle and used the stick part to hold up a plant in my garden. The handle I put on my desk. Every now and then I hold it. It’s like holding their hands. I can’t remember the title because I read it such a long time ago. I think I was still at school. I remember the main character going to Rio de Janeiro and visiting the statue of Christ. The description was so vivid that I remember telling myself I must go and see it. I haven’t been yet but it is still on my bucket list! I don’t think my friends are surprised by anything I do nowadays… And if there is something that will surprise them, I’ll save it to surprise them – ha ha! I want to create some structure to some ideas I have for a play I have been thinking about writing. To end, some more of Trish’s book covers, and a beautiful photograph of a dad reading So Much! 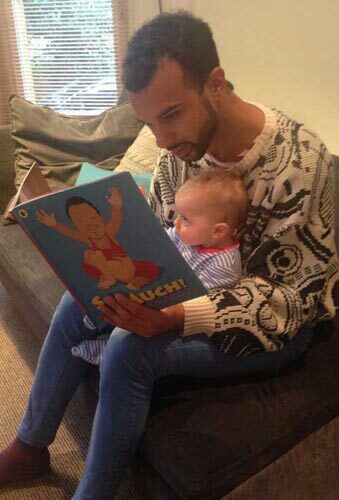 to his baby – the rapt expression on the baby’s face shows it’s never too early to share a book! All photographs are ©Trish Cooke and may not be reproduced without permission. The map of the Caribbean Islands is by Kmusser (Own work, all data from Vector Map) [CC BY-SA 3.0 ], via Wikimedia Commons. 'Branching Across the World: Trees in Multicultural Children's Literature, Alex Ayliffe, Alice Walker, bereavement in children's books, Caroline Binch, children's books about trees, children's books set in Dominica, Children's books set in the Caribbean, death in children's books, For Colored Girls Who Have Considered Suicide When The Rainbow is Enuf, Full Full Full of Love, Helen Oxenbury, Hey Crazy Riddle!, Look Back!, Maya Angelou, MWD interview, Ntozake Shange, Papillote Press, Paul Howard, Paulo Coelho, Polly Pattullo, Possessing the Secret of Joy, Sharon Wilson, So Much!, The Color Purple, The Grandad tree, Trish Cooke, Waiting for Baby, Walker Books, Zoom!. Bookmark. Thanks so much for publishing that lovely interview with Trish Cooke. 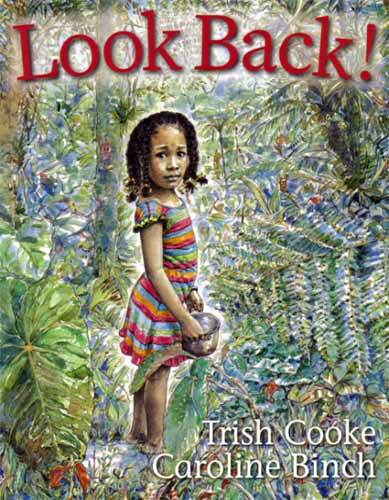 As the publisher of Look Back! I am delighted that you are able to spread the word about this really special book so sensitively written by Trish. And your questions are very engaging. So much appreciated. Thank you, Polly. I really enjoyed puting the interview together, and Trish was very generous in her responses. Very interesting interview. The use of the Ti Bolomn ( Ti Bolam ) character sure peeked my interest, a character we grew up with and one I have personally used in a few short stories. Great work. Wonderful Interview. Appreciate that fact that you took the time to include the distinction between Dominica and Dominican Republic. Thank you, Shermaine – and yes, I appreciated Trish explaining that distinction too – and so graciously, despite me getting it wrong! 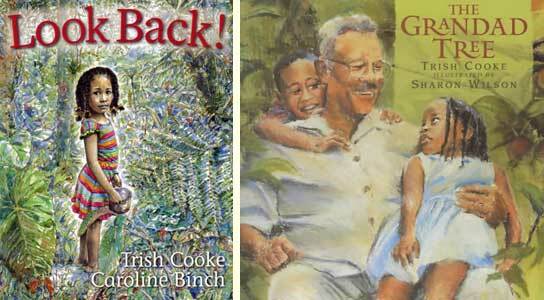 I’ve always been a fan of Trish Cooke’s books for toddlers, but I wasn’t aware of her two picture books for older kids. I’m looking forward to checking them out. This was such an interesting interview; I loved learning about her origins and that she likes Alice Walker and Maya Angelou as much as I do! Perfect timing! We are just starting our Caribbean unit with my third graders, and this is a wonderfully exhaustive interview. I can’t wait to check out more of her books! Thanks for sharing with #KidLitBlogHop! That’s great – and I’d love to know what other books you share as part of that unit. I remember Trish from play days, she was great, and now I have a godson whose mum is from the Caribbean. I have been looking for stories( not easy sadly) that he can see himself in and love Trish’s books to share with him. Thank you and for the interview. Visit Trish's website, which includes details about how to book a workshop for anyone from nursery-aged children right through to adults. Read Walker Books' profile of Trish, including 10 Things You Didn't Know. 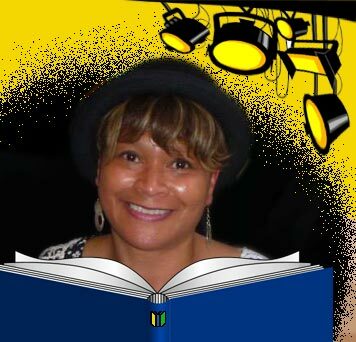 Read Trish's article about her journey as a writer of children's books on The Brown Bookshelf (2014) .